This may be the world’s most epic cake. This beautiful cake was created for the hungry patrons at the Arisia Sci-Fi Convention in Boston, MA. The stormtrooper stands at 6 feet 4 inches tall, weighed at least 300 lbs, and fed nearly 600 hungry conventioneers! The building of the Stormtrooper cake was an epic event in and of itself. It took our entire wonderful crew of ten people two full weeks of to put this guy together (although the cake wasn’t added until 2 days before it was to be served). Along the way we even had to invent completely new cake making methods so it could be put together modularly onsite, hold its fondant over long vertical stretches, and stand on two beautifully sculpted Rice Kripsy legs that supported his 300 lb body –all while keeping every bit of cake tasting light, fluffy, and delicious! It was a challenge to say the least, but we’re all incredibly proud, as we think it is perhaps the greatest sculpted cake ever created. A bold statement for sure, but we think think that the photos speak for themselves. Your probably wondering how we cut this cake. Here is a quick video on how we devoured our stormtrooper. Check out the pictures below to see how it all went together! Update: We made a pretty cool animated gif of the cake getting sliced and eaten! This is amazing! 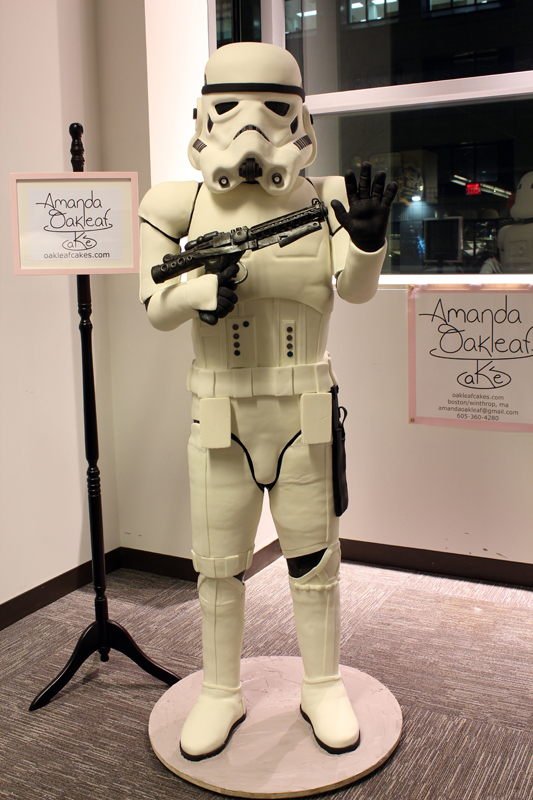 I posted a link to you on my blog: Life-Size Stormtrooper Cake (I also linked the How to Eat a Stormtrooper post.) Thanks for making something awesome! So Cool!!! Love to see work done by West Central graduates! That’s really amazing!! Stormtrooper cake! I never expect that Stormtrooper is a Delicious cake!! This is SOOOO impressive!! I love stormtroopers too!